Being a dedicated Christian takes much more than just going to church and reading the Bible. Its about having a relationship with the creator and understanding who you areand whose you are. The process can be difficult at first, but when you know that God is on your side, it makes a big difference. In S.H.E. 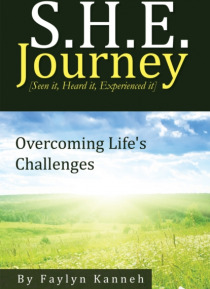 Journey [Seen It, Heard It, Experienced It], author, certified Life Coach and Mentor and… ordained minister Faylyn Kanneh offers a personal yet spiritual guidebook for those who have journeyed through the stormy seasons in life. It will help and direct you to overcome various challenges on your walk with Godand if you havent started yet, it can help you with a fresh new start. Every chapter is filled with experiences that will allow you stay on your path as you journey toward greatness, no matter your situations. It starts with learning who you are from, and it will take you to a place of total dependence on God, where you will realize the fulfilment of your God-given potential in becoming a better servant. Your situations, circumstances, pains, and overwhelming victories are all part of your journeyyou have seen it, you have heard it, and now its time for the real experience. With personal insights and the examples of the life experiences and challenges of some of the women in the Bible, you too can start the journey to success and stay on track with the help and trust of God.